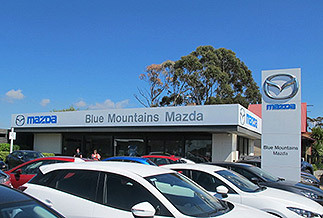 Welcome to Blue Mountains Mazda, on the Great Western Highway at Medlow Bath. We are your complete local Mazda dealer with service facilities, parts and accessories and official Mazda merchandise. Come in today and see the latest range at our showroom. Owned and operated by the Macarthur family, who have been involved in business and the community since the 1940’s, we are leaders in customer satisfaction, and can offer a true local buying experience. Offering the complete and diverse range of new Mazda passenger and commercial vehicles, as well as a wide range of used vehicles to suit all budgets we believe all your motoring needs can be fulfilled in a friendly, knowledgeable and professional environment. At Blue Mountains Mazda our state of the art Service Centre utilises the most modern technology available to ensure years of trouble free motoring for you. We offer local pick up and drop off for service customers, have low cost courtesy car availability and our factory trained technicians provide the best care for your Mazda. Our Medlow Bath location is open 7 days a week. When it comes to Mazda, let us make it happen for you.